I'm having trouble getting KVO working with text fields that are bound together in a Cocoa app. I have gotten this to work when setting strings in NSTextFields with buttons but it is not working with bindings. As always, any help from Stack Overflow would be greatly appreciated. 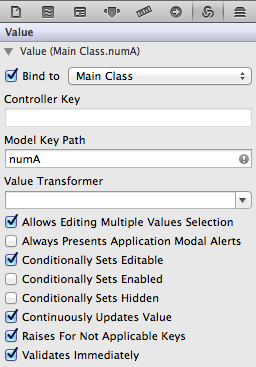 [ valueForUndefinedKey:]: this class is not key value coding-compliant for the key numA. [ setValue:forUndefinedKey:]: this class is not key value coding-compliant for the key numA. As a result, the NSTextField instances are not key-value observing compliant for @"numA", either: the first requirement to be KVO-compliant for some key is to be KVC-compliant for that key. It is, however, KVO-compliant for, among other things, stringValue. This allows you to do what I described earlier. 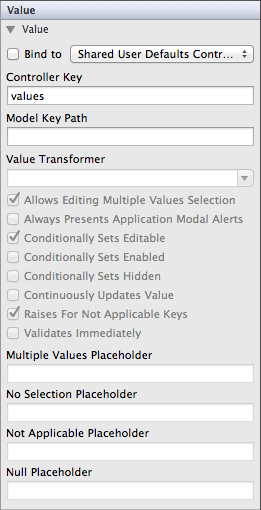 Note: None of this is altered by the way that you've set up bindings in Interface Builder. More on that later. Observing an NSTextField's value for @"stringValue" works when -setStringValue: gets called on the NSTextField. This is a result of the internals of KVO. In general, the name of the class changes from Object to NSKVONotifying_Object. Breaking within any of these methods reveal that they're called from the undocumented function _NSSetObjectValueAndNotify. How does this relate to NSTextField and @"stringValue"? In your previous setup, you were adding an observer to your text field on -awakeFromNib. This meant that your text field was already an instance of NSKVONotifying_NSTextField. 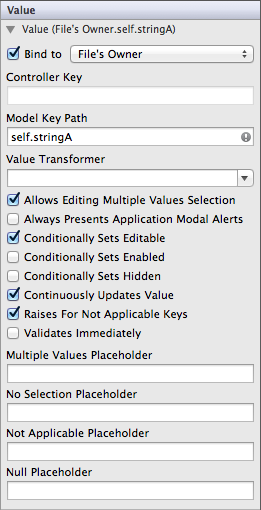 As above, from within didChangeValueForKey:@"stringValue", all the objects which are observing the text field's value for @"stringValue" are notified that the value for this key has changed in their own implementations of -observeValueForKeyPath:ofObject:change:context:. In particular, this is true for the the object which you added as an observer for the text field in -awakeFromNib. In summary, you were able to observe the change in the text field's value for @"stringValue" because you added yourself as an observer of the text field for that key and because -setStringValue was called on the text field. Observing an NSTextField's value for @"stringValue" works when -setStringValue: gets called on the NSTextField. And that sounds great! So what's the problem? The problem is that -setStringValue: does not get called on the text field as the user is typing into it OR even after the user has ended editing (by tabbing out of the text field, for example). (Furthermore, -willChangeValueForKey: and -didChangeValueForKey: are not called manually. If they were, our KVO would work; but it doesn't.) This means that while our KVO on @"stringValue" works when -setStringValue: is called on the text field, it does NOT work when the user herself enters text. TL;DR: KVO on the @"stringValue" of an NSTextField isn't good enough since it doesn't work for user input. The pop-up button next to the "Bind to" checkbox presently has "Shared User Defaults Controller" selected. We want to bind the text field's value to our WindowController instance., so select "File's Owner" instead. 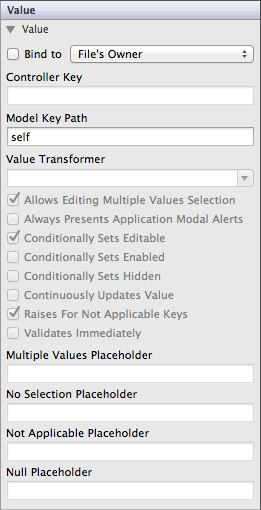 When this happens, the "Controller Key" field will be emptied and the "Model Key Path" field will be changed to "self". At this point, we are done. (Progress so far on GitHub.) We have successfully bound the text field's value to our WindowController's property stringA. This looks great. Why haven't we been talking about this all along??? There's a bit of a hitch here: the pesky pressing tab thing. Binding a text field's value to a string does not set the string value until editing has ended in the text field. However, there is still hope! The Cocoa Binding Documentation for NSTextField states that one binding option available for an NSTextField is NSContinuouslyUpdatesValueBindingOption. And lo and behold, there is a checkbox corresponding to this very option in the Bindings Inspector for NSTextField's value. Go ahead and check that box. 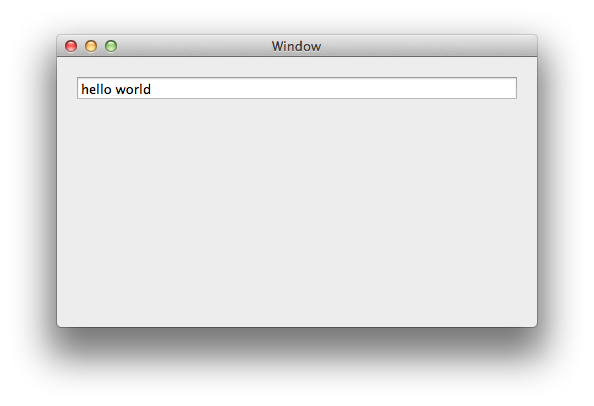 Finally, we're continuously updating the window controller's string from the text field. The rest is easy. As a quick proof of concept, add a couple more text fields to the window, bind them to stringA and set them to update continuously. You at this point have three synchronized NSTextFields! Here's the project with three synchronized text fields. Next we'll bind the first text field to numberA on File's Owner, the second to numberB, and so on. Finally we just need to add a property which is the quantity which is being represented in these different ways. Let's call that value quantity. Now, whenever you type into one of the textfields, the others are updated accordingly. Here's the final version of the project on GitHub. Not the answer you're looking for? Browse other questions tagged objective-c cocoa cocoa-bindings key-value-observing nstextfield . How do you set the text in an NSTextField?